Economically, the next 12-18 months promise to be a buoyant time for the nations of Central Europe. Global manufacturing activity has perked up since the late summer of 2016, providing a strong tailwind for the region – an industrial powerhouse closely connected to German companies. There are, however, some storm clouds looming over the horizon. Central Europe is facing daunting political and economic challenges in the coming years. The prospect of the European Union attempting to reinvent itself, coupled with possible shifts in the foreign policy of the United States create a set of risks for the region. For the first time in recent history, the nations of Central Europe face a strategic uncertainty – or, simply put, difficult choices putting their leaders and their institutions to maturity tests. Confronted with a variety of geopolitical, economic and ideological options, they will struggle to find the right path. After the fall of the Iron Curtain in late 1989, Central Europe saw only one, strategically obvious path to follow: integrate with the West, politically and economically. The region was like a success-hungry student who had only one good school in which to enroll, and pulled out all the stops to get in. The prospect of joining the EU and NATO was an incentive powerful enough to allow the governments to implement radical free market and democratic reforms during the 1990s: privatizing state companies, introducing independent judiciary systems, stabilizing prices and budgets, withdrawing state support for industries or imposing civilian oversight of the armed forces. Thanks to these, Central Europe has become one of the globe’s growth champions over the last two and a half decades. Now, however, the environment has changed. The anchor of integration is no longer holding, because the EU is in disarray and its member states will most probably start moving toward more flexible forms of cooperation. During the summit in Malta in February 2017, German Chancellor Angela Merkel observed, “The history of recent years has shown that there will be a multi-speed EU and not all members will participate in the same steps of integration.” Some pundits call it “Europe a la carte,” meaning that countries will determine on their own the depth of integration they find appropriate. Moreover, U.S. engagement in Europe has been evolving, albeit slowly, because of Washington’s pivot to Asia. This process can accelerate rapidly if the administration of President Donald Trump indeed seeks, and achieves, some kind of detente with Russia. On top of that, Central Europe has been hit by a tide of ideological revolution that undermines the role of free markets and free trade. It appears to be a knock-on effect of Western societies’ frustration with the economic dislocation many have attributed to free trade, made evident when a liberal economic icon such as Harvard University’s Lawrence Summers calls for “responsible nationalism.” In Central Europe, liberal capitalism is no longer accepted wholesale by mainstream political parties. The comfort of having obvious choices has gone for Central Europe. The challenges lying ahead are of enormous proportions and the scale of uncertainty is much greater than the region’s political classes have been accustomed to. There are three fronts on which the governments of the region are facing maturity tests. The first is a test of agility in foreign policy and the ability to make the right strategic choices. The second is a test of competitiveness and macroeconomic stability. The third is a test of resistance to Russian-inspired destabilization attempts. On the foreign policy front, Poland will continue its effort to lead a regional coalition representing the interests of Central Europe within the EU. But Warsaw’s ambition is almost certain to be frustrated. Central Europe, like the Middle East, Latin America or Southeast Asia, is a divergent region. Its member states find it hard to band together to deal more effectively with regional powers. There are various reasons for this, with individual countries’ ambitions being the most obvious. Differences among members of the Visegrad Group (Poland, Hungary, Slovakia and Czech Republic), for example, prevent them from developing a common approach to Germany and to other Western partners. The Poles and Hungarians advocate an assertive stance, while the Slovaks and Czechs treat their close alliance with Germany as the cornerstone of their foreign policies. Additionally, there are divisions running along a different line on how to approach Russia. Hungary, and, to a lesser extent, the Czech Republic and Slovakia, often send conciliatory signals to Moscow, whereas Poland and the Baltic states treat Russia as an existential threat. The key question for 2017 and 2018 is whether Germany will take upon itself the role of the main player – guarantor of safety and order in Central Europe. Economically, Germany has already been a decisive force in the region: it fostered its integration with the EU. Now, with an expected decline in U.S. interest in Central Europe coupled with Russia’s increased activity in the region, Germany’s role is more important than before. Berlin clearly understands its new challenges. Not by accident, German Chancellor Angela Merkel visited Warsaw shortly after the inauguration of the new U.S. president and met with Poland’s key decision makers. There is a widespread belief among experts in Warsaw, regardless of their political bent, that Germany will become a crucial ally. Berlin appears willing to accept that democratic institutions in some countries are not top-notch, but it nonetheless wants to maintain strategic alliances in the region. If Germany moves to enhance European cooperation in key fields such as the single market, security or energy policy within the new, more flexible EU, then Central Europe as a whole will remain interested in participation. In this scenario, Central Europe will naturally be drawn into the integration process and remain anchored in the EU’s institutional framework. If, however, Germany accepts that the eurozone is the main circle of integration in Europe, this scenario will be at risk. The EU would lose its present significance and members who have not adopted the common currency would drift away. It is not an exaggeration to say that Berlin’s policy decisions will play a huge role in Central Europe’s future. 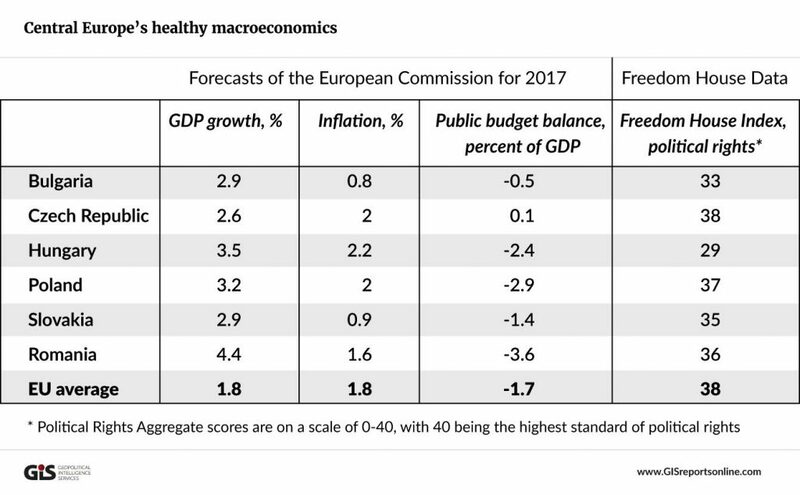 Another set of critically important tests for the Central European countries will relate to internal issues – macroeconomic, political and institutional. Macroeconomic stability seems probable in the short term. Inflation, budget deficits and current accounts in most countries are under control. The region’s economies have rebalanced after the 2008 financial crisis and are not endangered by the turbulences that have depressed emerging markets like Brazil, Turkey and South Africa in recent years. It is difficult to find weaknesses in Central Europe’s macroeconomic landscape that could bring domestic shocks in the near term. However, some trends under the surface warrant attention. The region faces increasing costs of its rapidly aging societies. Once the countries are cut off, even partially, from the EU’s financial largesse, the benign macroeconomic landscape of Central Europe may become more adverse. It is not a matter of the next 12-24 months, but it is worth observing how a weakening of institutional and ideological anchors impacts stability. The fraying of the EU’s internal bonds is an important risk factor, because the union’s rules on fiscal and monetary policies create pressure on local decision makers to maintain stability. Also, a declining popular belief in liberal recipes for the economy leads to increasing acceptance for non-orthodox policies. While not inherently wrong, the process opens the gates for more extreme forms of populism in the future. 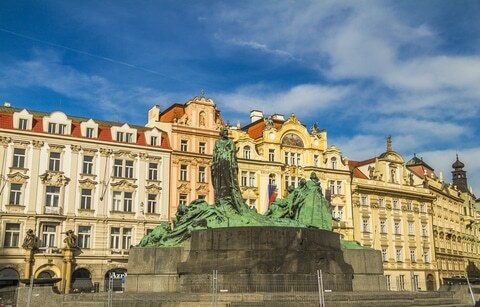 For example, the Polish government introduced a heavy tax on bank assets to fund its generous social programs, and now the Czech leaders are mulling the same option. This is not dangerous itself, but demonstrates that a shift in ideas can generate additional business uncertainty. Political stability is an even more delicate issue. Only recently Western governments have begun to face the reality that concerted covert efforts to destabilize them may have been under way. If the apparent belief among the U.S. intelligence community that the Russians secretly interfered in the presidential elections is not mistaken or grossly overstated, then Central European countries also have a reason to be concerned. These countries have scant resources to counter such subversion. Political inexperience, relatively weak institutions or lingering ethnic conflicts (for example between Hungary and Slovakia, or Poland and Ukraine) make the region fertile ground for foul play. Historically, nationalist movements have been strong in this region of blurred ethnic borders, but after the countries’ successful transition from communism to democracy their role faded. Today, Central Europe’s nationalists have been gaining ground again (many groups with Russia’s support) and are starting to exert influence in mainstream politics. This constitutes an important risk factor for political stability. Engagement and stability are the key words describing Central Europe’s challenges and the criteria to measure its progress. The coming year or two will show how these challenges are met.